Hello there, my beloved readership. Fret not, there are many, many posts in planning, but due to the preparations for tomorrow's Jessica Albarn show, I didn't get to spend a lot of time here on the picturesque interwebs. So instead, let's have another competition, shall we? Mainly because I'm so super generous but also, because you proved how very smart you are in the last few riddles and I was so deeply impressed that I actually believe we should all found a neo-Platonic iAcademy where we start growing impressive beards and walk up and down columned halls on ChatRoulette mumbling nonsensical Greek theorems while rubbing our collective chin. Oh, yes, it will be a new dawn of braiiiiins! Anyhow, so today's conundrum is therefore especially challenging, but if you kept up to date with the WurzelBlog since its infancy, and happen to have very keen eyes, you should be able to solve this mystery. What is so very clever about the blocks in Koen Hauser's Nigredo photograph from his Opus Magnum Atomium series (see image above)? 6 comments to " WurzelCompetition No. 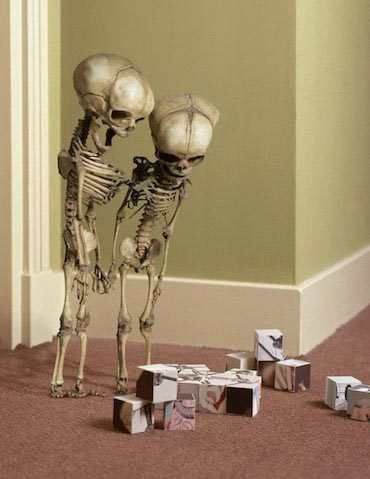 7938612 "
skeletons are staring at some trevor brown stuffs? Nope. It's not Trevor Brown stuff, I'm afraid. It's actually photographs. But whose? I think that's enough of an answer already. So the clever thing about the photograph is that all the bricks are made of other photographs from the "Opus Magnum Atomium" series. Well done. Can you email me your address so that I can post the little gift? Awww... I'm glad you like your little, well-deserved present. Well done!